Valleybrook - MLS#3494197. Golf Realty, Inc.
Main level features huge coffered ceilings with open floor concept, granite kitchen w/ center island, stone fireplace living room, dining area,formal dining room and master bedroom suite.Second floor family room/rec room adds extra TV/homework space.Full unfinished basement is studded and has walkout to patio/backyard.Entertainers delight in tree lined back yard with several open acres of land.This property is available to the buyer who acts NOW.... Stop reading and start calling! MLS#3495486. Better Homes and Gardens Real Estate Paracle. Shannon Acres - Tons of storage, bonus room up could be the 5th bedroom. 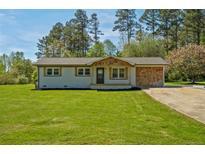 MLS#3494782. Allen Tate Statesville. Great neighborhood for walking, biking, or bring your golf cart!! Seller motivated !! Must see! ! MLS#3494122. Allen Tate Statesville. An additional 28.7 acres available next door. MLS#3495033. Royal Properties.